While the Global Warming fanatics are out in force saying “see” the heat in Europe is caused by humans driving their cars around, they continue to ignore history...The extreme heat in Europe this year is part of a cycle. The swings from extreme heat to extreme cold are also not unheard of. Another piece of historical evidence they ignore is known as the Hunger Stones. This is at Decin, in the Czech Republic. Throughout the centuries, there have been these cycles of extreme heat followed by extreme cold. Such events have been recorded when drought has resulted in the low level of water in the Elbe river. 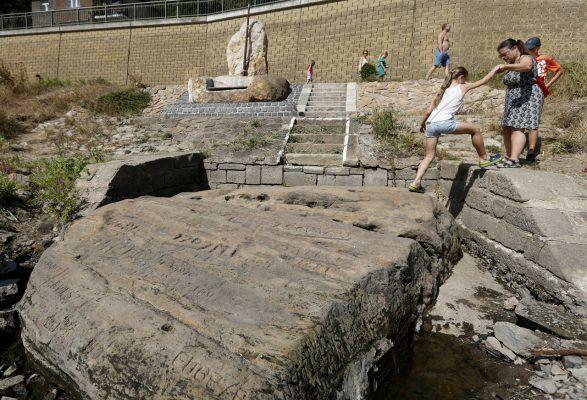 This year’s drought in Europe has exposed once again the Hunger Stones that have been used for centuries to commemorate historic droughts which warn of their consequences when you see these stones again. The Hunger Stones are visible in the Elbe River once again. This is a major river which begins in the Czech Republic and flows through Germany. There are more than a dozen Hunger Stones that serve as records of previous droughts establishing that the extreme heat and drought of this year is by no means unique to history. The various Hunger Stones record droughts that resulted in famine and soaring prices for food. The droughts that have been recorded on the stones date to 1417, 1616, 1707, 1746, 1790, 1800, 1811, 1830, 1842, 1868, 1892, and 1893, which covers a period of 476 years. This produces an average of 39.6 years. Just applying that average would bring you to 2012. However, we have to look closer. Note that two years 1892 and 1893 are back-to-back. This does not reflect two separate droughts, but the peak in intensity. Instead of there being TWO separate droughts, it is the same even just extended. That means there were really 11 events within this 476-year span of history and low and behold this alters the average to 43.27 years. This actually conforms to our Economic Confidence Model frequency of 8.6 years /2 = 4.3. In fact, additional evidence that is being ignored by the Global Warming crowd who seem intent upon leading society to its doom by ignoring the past entirely. Extensive research has also been done on tree-rings in north-central Europe. This study has discovered that there has been a pattern of “megadroughts” in the 15th through 19th centuries. They classified 1893 as the “Great Drought of 1893” where rainfall decline between 30 to 90% throughout various regions in Europe. They also found that the Irish famine of 1740–1741 was the result of a cooling period they pointed out resulted in unusually low winter and spring temperatures in 1740 that produced in crop failures and a massive subsequent famine. They point out that there were five major “megadrought” that took place in 1540, 1590, 1616, 1718, and 1719. Once again, we see back-to-back events in 1718 and 1719 which in our analysis reflect a build up in intensity rather than two separate events. Reducing this to 4 evens once again gives us an average of 44.75 years which is very close to the Pi frequency. If we plot this serious out, we arrive at 2020. It appears that instead of a back-to-back event in 2019, this can become the worst period of intensity and produce three years of drought into 2020. The greater the number of volcanos erupting can also produce an increase in intensity for this period. What we must be concerned about is volcanic activity appearing in the West Indies, which includes Soufriere on St. Vincent. It is the stratovolcano type event that can change the weather. These are volcanoes that are known as a composite volcano, which is a conical volcano built up by many layers (strata) of hardened lava, tephra, pumice, and ash. When they erupt, this sends a tremendous amount of material into the atmosphere which reduces sunlight and cools the temperatures. When we ran the drought data through our models, not only did it correlate with the ECM, it also coordinated with the first historical eruption of the volcano which took place during 1718 and a subsequent eruption 1812. Now, look at the drought records of megadroughts – 1718/1719. When we ran the model, out comes the year 1816 which s known as the Year Without a Summer. The climate turned extremely cold and it was snowing in July in New York City. This resulted in major food shortages across the Northern Hemisphere. Note that the second eruption was 1812. When we correlated this entire period, what emerged was a dramatic increase in volcanic activity which also correlated with the decline in the energy output of the sun. 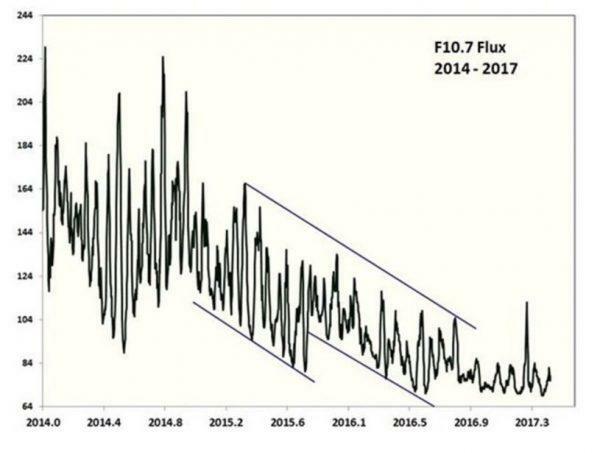 Our model warned that volcanic activity would rise beginning here in 2018 correlated with a decline in the energy output of the sun which should have begun in 2015. 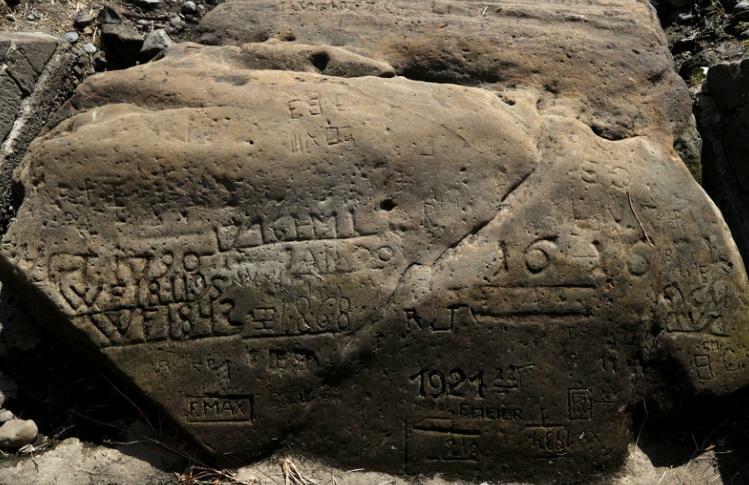 Note that the Hunger Stones also mark the year 1811. While this is one year prior to the eruption in the West Indies in 1812, there is what has been called the 1808/1809 Mystery Volcanic Eruption which seems to have set in motion a Mini Ice Age during the early 1800s. This was a monumental volcanic eruption in the VEI 6 range which appears to have taken place in late 1808. This event preceded the 1815 eruption of Mount Tambora (VEI 7) which produced the Year Without a Summer in 1816. There was the period climatologists called the Little Ice Age they believed took place starting around 1650. 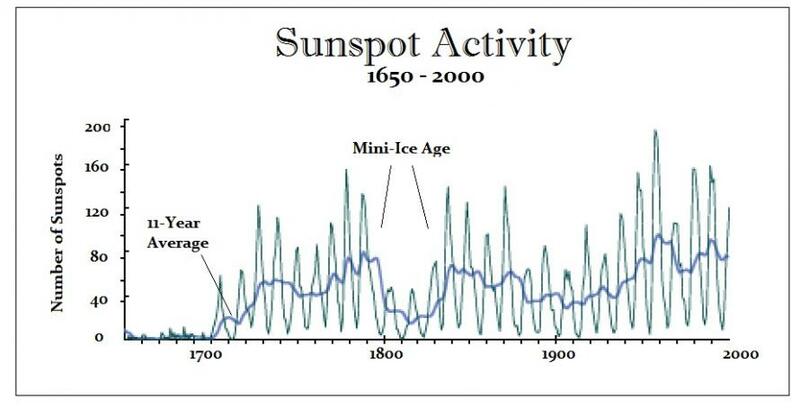 This was the result of primarily the decline in the energy output of the sun reflected in the drastic decline in sunspot activity. What we are looking at here is a drastic correction in market-terminology which took place during the early 1800s. A study of Greenland and Antarctic ice cores in the 1990s revealed evidence that pointed to a massive volcanic eruption that had occurred in early 1809. The problem that everyone face was there were not human records of such an event. This meant that it must have been in a region where humans did not record the event. Additional research revealed from tree-ring data that there was also a major eruption in 1808. Now two independent sources were pointing to a mystery eruption – but where? The mystery was simply that such a catastrophic eruption of that magnitude should have been noticed by someone. They began to scour the records around the world hoping that someone somewhere recorded the event. Finally, in 2014 a Ph.D. student Alvaro Guevara-Murua and Dr. Caroline Williams of the University of Bristol discovered an account of atmospheric events consistent with such an event by Colombian scientist Francisco José de Caldas who recorded a massive transparent cloud that obstructed the sunlight at Bogotá, Columbia in early 1809. The further investigation revealed that the cloud was first been observed by him on December 11th, 1808. De Caldas reported conditions consistent with a volcanic cloud that altered the weather turning it unusually cold, with even bitter frosts in Columbia. Further investigations to the south in Peru produced another observation by a physician named Hipólito Unanue of Lima. Combining these two observations led to the conclusion that the window of the eruption was sometime within 14 days of December 4th, 1808. The only area in the tropics to the west of Colombia and Peru with possible volcanoes was also located in the South Western Pacific Ocean between Indonesia and Tonga. At the time, there was hardly any reporting coming from this region lacking European settlements. The Rabaul area has had such major VEI 6+ eruptions but records only date back to the mid-1800s. However, this one catastrophic VEI6+ eruption is NOT the only volcano that erupted. This is why we have warned that the cyclical period for volcano eruptions turned upo with 2018. In 1808 there were major additional eruptions in Urzelina, the Azores during May (1st to 4th), as well as the Taal Volcano, in the Philippines during March that year. There was also the Chilean Putana volcano which had a major eruption during of 1808-1810 (records are not precise) This period is then followed by the truly massive 1815 eruption of Mount Tambora in the Dutch East Indies. This one is attributed with creating the Year without a Summer because it was the largest eruption in at least 1,300 years that has been recorded. This event was followed by the 1814 eruption of Mayon in the Philippines, which appears to have contributed to the weather changes of cooling creating an accumulative event. The ice core samples clearly show actually two very large sulfate peaks that occur with volcanos. The first took place during 537AD and the second follows in 541—542AD. Therefore, once again we may be dealing with multiple volcanic eruptions. Both peaks are approximately the same size. It is the first event that has been recorded as the catastrophe. Contemporary historians mention above have provided contemporary accounts of this dramatic decrease in the Sun’s brightness during 536 and 537 AD. We have yet another contemporary account of a historian from Constantinople (Hamilton and Brooks, 1899, p. 267), believed to be Zacharius of Mytilene, who describes: ‘”In the year 14 [536 AD], the Sun began to be darkened by day and the Moon by night… from the 24th of March in this year until the 24th of June in the following year 15.” Because the dimming was less severe and shorter in duration, it is generally assumed that the atmosphere was filled with fine volcanic ash or dust from this event. (Rigby et al., 2004; Larsen et al., 2008), There is no question that SO2 emissions from volcanos produce a cooling trend in weather. However, it has also been shown that there is a time lag between 6 and 18 months that will vary depending upon how far up the ash is thrust into the atmosphere. Thus, there can be a delayed effect from when the eruption actually takes place. Yet there is still another theory that strangely comes into play this October/November. The argument is that we pass through a particularly dense section of the Taurid Meteor path around every 2500 years and this has contributed to legends and climate change. Every year there are as South Taurid Meteor shower which will peak overnight on Oct. 9-10 for the Southern Hemisphere and then in the Northern Hemisphere, the North Taurid Meteor shower peaks Nov. 11-12. This has provided the foundation for love stories and wishing upon a shooting star. However, there have been intense Meteor storms that led to legends of dragons fighting in the sky breathing fireballs at each other. Chinese historical records from 540AD describe: “Dragons fought in the pond of the K’uho, They went westward … in the places they passed, all trees were broken.” Ice core sample also contain extraterrestrial dust from this period as well. It is argued that a larger meteor struck the Earth about this time and this is what is described as dragons fighting in the sky. The one major known meteor even is that of Tunguska which was a large explosion that occurred in Russia, on the morning of June 30th, 1908. 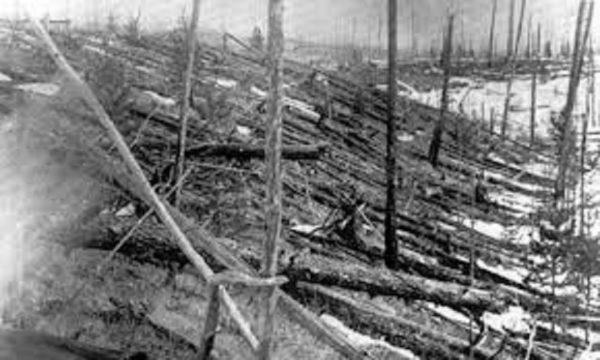 The explosion flattened 770 square miles (2,000 square kilometers) of the forest. The explosion is classified as an impact event, even though no impact crater has been found. The meteor is believed to have exploded above ground and thereby disintegrated at an altitude of 3 to 6 miles before it actually struck the ground. This is the largest impact event on Earth in recorded history, not geological history. Meteorite impacts are by far perhaps among the most destructive forces in the solar system. It is believed that such events have resulted in mass extinctions. However, there are others who suggest that they may have also delivered the seeds of life soon after Earth was born. 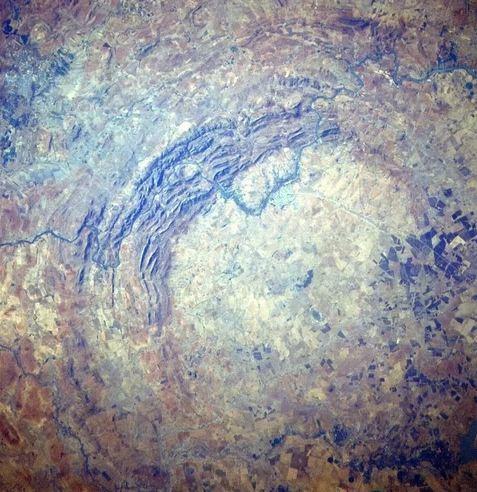 The oldest impact crater on Earth is also the largest and it is located in South Africa. It is known as the Vredefort Crater for it was originally 185 miles in diameter which struck some 2.02 billion years ago (pictured here). There is another major impact known as the Chicxulub crater located in the Yucatan peninsula of Mexico which is 93 miles in diameter that some argue may have wiped out the dinosaurs with a blast that was equal to the estimated energy of 10 billion Hiroshima A-bombs which took place about 66 million years ago. Sodom and Gomorrah which are most likely located at the Dead Sea may have been destroyed by debris from a comet, startling new archaeological and astronomical research suggests. The Dead Sea is famous for is extreme salinity (34% salt, or almost 10 times as salty as the ocean), and for having the lowest elevation on Earth, at 1,407 feet (429 meters) below sea level. The argument remains that there was a simultaneous fall of the Old Kingdom of ancient Egypt, the Sumerian civilization in Mesopotamia and the Harrapin Civilisation of the Indus Valley. In total, some 40 cities are thought to have disappeared, in a series of catastrophes. Many astronomers believe that the Earth was bombarded by a particular dense storm of meteorites over a couple of centuries every 2,500 years. The last two occurrences were around 2200-2000BC and 400-600AD. Part of the evidence is that three Middle Eastern regions all contain a calcite material found only in meteorites. 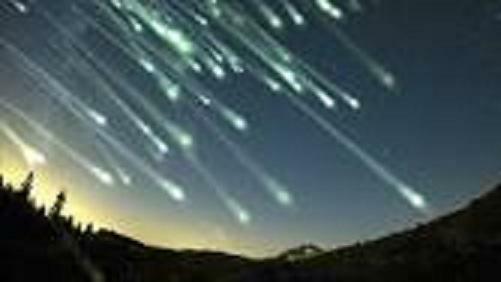 They argue that the Biblical account found in Genesis describes how “the Lord rained upon Sodom and upon Gomorrah brimstone and fire from the Lord out of Heaven” which is a description of a meteorite storm. When all is said and done, we may be as insignificant as a pebble lying at the bottom of the ocean with no understand what lies above our heads.